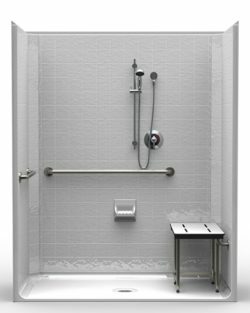 When you picture an accessible, adapted bathroom, what do you see? A functional yet somewhat institutional-looking space, fit for purpose but lacking character and style? If so, you might be surprised when you take a look at our designer handicapped bathroom showers. We at ORCA HealthCare have vast experience of supplying accessible bathrooms to a wide range of customers. We understand that the appearance of your bathroom is important, and that you might not always be prepared to compromise on style when remodeling. With our designer series, you don’t have to. Our designer showers have recessed panels into which you can add your own regular tiles. 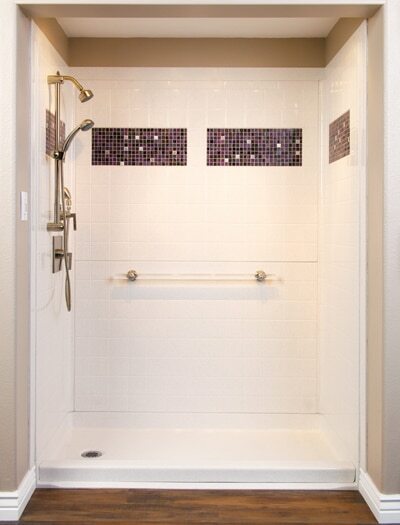 This lets you easily match your walk-in or wheelchair accessible shower to the rest of your bathroom. Use ceramic or glass tiles to finish your ORCA designer series installation – the choice is yours! 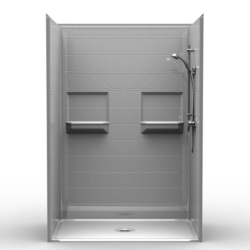 Our designer handicapped bathroom showers are available with a variety of thresholds. This means you’ll have no problem finding one suitable for your needs. Whether you require a roll-in or walk in handicap shower, it’s easy to create a safe, comfortable and stylish bathroom with our extensive range. 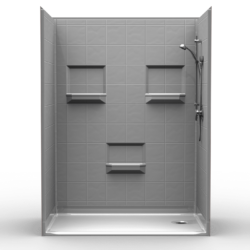 All our designer handicapped bathroom showers feature the same high quality workmanship and superior materials as the rest of the ORCA range and can be finished with one of our safe bathing accessory packages if desired. 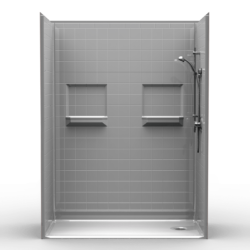 We know that our customers want quick, straightforward installation, so all our wheelchair accessible shower pans are pre-leveled in the factory. 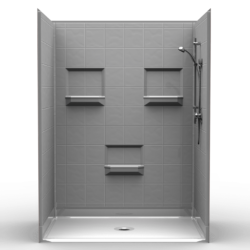 This speeds up the installation process and ensures your stunning new bathroom is ready to use in no time. If you’d like to know more about our designer safe bathing series – or any of our range – please get in touch. We’d love to hear from you and answer any questions you might have!